Everything is my favourte .. how do I choose ?? Our tiny bundles of scrummyness grow so quickly that there is hardly time for them to wear all of the precious items of clothing you excitedly bought before they arrived, clothing that was gifted when your new baby arrived or treasured pieces that you have made especially for their first new adventures in the world. How do you start selecting which ones will look best on your Ooo Bear? We get asked this question time and time again so we thought we would try and answer some of your questions in this guide to hopefully help the decision making a little easier. Our beautiful Ooo Bear sits approximately 12-13 inches high, and is made with a total of 24 pieces. We need a minimum of 8 sleepsuits aged 0-3 months or larger. Don’t worry though, we can also use smaller sized sleepsuits as we know that often those precious first wardrobes are usually teeny tiny .. all we ask is that for each 0-3 month sleepsuit you substitute please send two New Baby / Tiny baby sleepsuits instead (for eg, if all of your clothing is Newborn size we would need approximately 16 items). Choosing the right clothing is a matter of personal choice and your Ooo Bear will live and love in your house forever so the advice we always like to give is that you ask yourself which items of clothing have the most stories? The stories that you would like to treasure and retell your family forever. Do not worry so much about colours and if they compliment each other .. the most precious thing about an Ooo Bear is that it is the memories that bind them not the matching arms and legs. 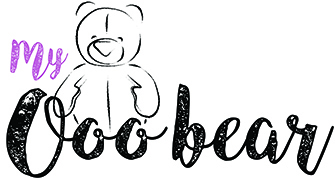 Plain or patterned clothing is absolutely perfect for your Ooo Bear, T-shirts, baby vests, Pjs, or leggings .. anything made from jersey material. However if you have items that contain logos / motifs or your clothing is made from cotton non-stretch fabric (i.e. a shirt) please see the breakdown below to help you with your selection. Hopefully this guide will help you choose your memories .. do not forget to enjoy the special process of picking them out, as this too is part of an Ooo Bears magic. If of course you simply cannot decide please just get in touch and we will be more than happy to talk you through the process or take a look at the items you have and give you our advice and help. Tummy / Back: these are the largest areas on an Ooo Bear so are perfect for the large motifs or writing that are usually found on sleepsuits that are full fronts (no poppers down the middle) or sleepsuits with the poppers / zips that curve from one side of the neck down to the opposite leg in an arc. As we use 4 pieces to make the body of an Ooo Bear we can usually add 4 motifs to this area, with the 2 tummy panels being the most prominent. Front / back of head: If you have any 3-6 month (or larger) front popper sleepsuits that have a motif on the chest area these can be included here if they are not too large or too close to the seams. We would recommend no more than 2 just incase the motifs don’t work for the front of the head which does have a few limitations with the eyes and nose area. Pockets from the front of sleepsuits are also a good option for the back of an Ooo Bears head – this is an added bonus because it means you can collect tiny things in them like their hospital bands and their tummy clamp for example. Legs: the best kind of motifs for legs are usually smallish ones that you sometimes find on the front of vests. Although the motifs have to be central to the vest for them to work on legs. We can also use cotton shirts or other non-stretch materials for this area. Arms: Here we can use most motifs that are situated on the front of sleepsuits that have poppers down the middle. We can use slightly longer motifs that we would typically use for the head. Pockets on the front of sleepsuits are also a good option for arms, although no more than 2 pockets / motifs are advised. We can also use cotton shirts or other non-stretch materials in this area. Ears: We try really hard to place something special on your ears, maybe images from a patterned sleepsuit, or tiny small motifs that are on baby vests. Max 2 small motifs are advised. Foot pads: This depends on if you are having embroidery or not. If no embroidery is chosen then we will try and place some small motifs (no bigger than 5cm x 5cm) on the footpads. We can also use cotton shirts or other non-stretch materials for this area.